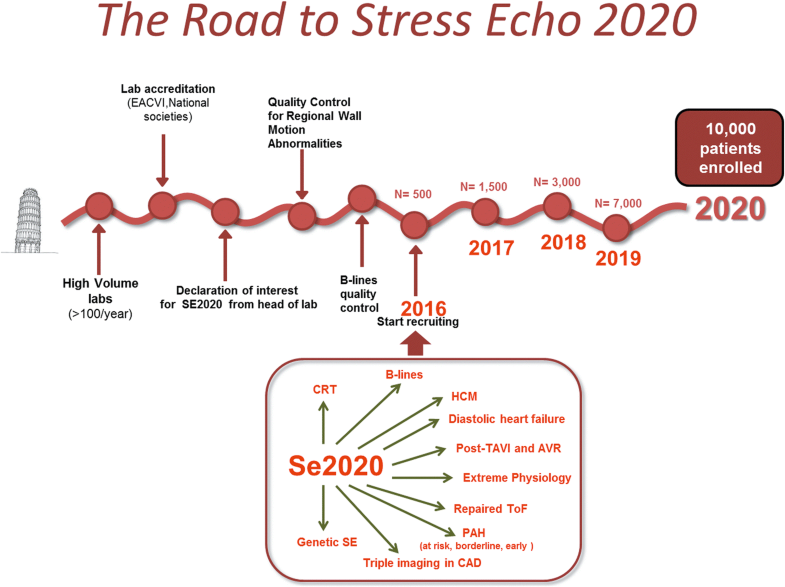 The effectiveness trial “Stress echo (SE) 2020” evaluates novel applications of SE in and beyond coronary artery disease. The core protocol also includes 4-site simplified scan of B-lines by lung ultrasound, useful to assess pulmonary congestion. To provide web-based upstream quality control and harmonization of B-lines reading criteria. 60 readers (all previously accredited for regional wall motion, 53 B-lines naive) from 52 centers of 16 countries of SE 2020 network read a set of 20 lung ultrasound video-clips selected by the Pisa lab serving as reference standard, after taking an obligatory web-based learning 2-h module (http://se2020.altervista.org). Each test clip was scored for B-lines from 0 (black lung, A-lines, no B-lines) to 10 (white lung, coalescing B-lines). The diagnostic gold standard was the concordant assessment of two experienced readers of the Pisa lab. The answer of the reader was considered correct if concordant with reference standard reading ±1 (for instance, reference standard reading of 5 B-lines; correct answer 4, 5, or 6). The a priori determined pass threshold was 18/20 (≥ 90%) with R value (intra-class correlation coefficient) between reference standard and recruiting center) > 0.90. Inter-observer agreement was assessed with intra-class correlation coefficient statistics. All 60 readers were successfully accredited: 26 (43%) on first, 24 (40%) on second, and 10 (17%) on third attempt. The average diagnostic accuracy of the 60 accredited readers was 95%, with R value of 0.95 compared to reference standard reading. The 53 B-lines naive scored similarly to the 7 B-lines expert on first attempt (90 versus 95%, p = NS). Compared to the step-1 of quality control for regional wall motion abnormalities, the mean reading time per attempt was shorter (17 ± 3 vs 29 ± 12 min, p < .01), the first attempt success rate was higher (43 vs 28%, p < 0.01), and the drop-out of readers smaller (0 vs 28%, p < .01). Web-based learning is highly effective for teaching and harmonizing B-lines reading. Echocardiographers without previous experience with B-lines learn quickly. Stress echocardiography (SE) has some advantages over competing imaging techniques, including low cost, portability, radiation-free nature and versatility. Its major limitation is the dependence upon operator’s expertise, which may impact on the quality and consistency of diagnostic results [1, 2]. This limitation is magnified when the technique is used for scientific purposes in a multi-center trial such as Stress Echo 2020 (SE2020) study, designed to provide effectiveness data in 10,000 patients from > 100 laboratories in a variety of conditions ranging from coronary artery disease to heart failure (with preserved or depressed ejection fraction), hypertrophic cardiomyopathy, repaired congenital heart disease, valvular heart disease and extreme physiology . To achieve harmonization, one possible approach is the use of the core lab which analyses centrally images sent from all recruiting sites. This approach is typically the preferred choice in a clinical trial and minimizes the sources of measurement variability [4, 5]. The core lab option was discarded in SE 2020 for two reasons. First, it was too costly and logistically demanding. Second, it would provide efficacy data under ideal conditions, but our aim was to obtain effectiveness data realistically generated when the technique is deployed in the clinical arena, populated by real patients, real doctors and real problems . A feasible approach to ensure consistency in data acquisition and interpretation in this challenging setting is to develop an upstream reading quality control for prospective centers willing to enter the study [7, 8]. In SE2020, this approach has already been implemented for regional wall motion abnormalities (RWMA), which remains the diagnostic cornerstone of SE . However, a separate quality control needs to be performed for other aspects of contemporary SE practice, such as B-lines obtained with lung ultrasound (LUS) . Also known as ultrasound lung comets, B-lines are a sign of accumulation of extra-vascular lung water  and can acutely increase during stress [12–14]. Their presence and/ or increase during stress places the patient in a higher risk subset for any level of RWMA  and indicates that dyspnea is linked to acute backward heart failure . B-lines assessment must be properly standardized and quality-controlled prior to dissemination and use for clinical and scientific purposes. The present report was part of the larger SE2020 study and focuses on the educational aspects of LUS-SE, describing the results of the upstream quality control and harmonization of B-lines reading criteria across 52 SE2020 centers. The Pisa lab coordinated the quality control assessment for B-lines of all investigators who expressed their intention to participate in the study (Fig. 1). The coordinating center was in the National Research Council, Institute of Clinical Physiology in Pisa, Italy. The candidate centers included 52 centers (each with at least one certified reader) from 16 countries (Argentina, Brazil, Bulgaria, Costa Rica, Hungary, Italy, Lithuania, Mexico, Poland, Portugal, Romania, Qatar, Russia, Serbia, UK, USA). The selection criterion was that all readers had already passed the quality control for RWMA reading (step 1 in the “Road to SE 2020”). The B-lines reading was the step 2 in the “Road to SE 2020”. The complete list of participants in the SE2020 consortium (as per January 20th, 2018) is reported in the Appendix. The study protocol was reviewed and approved by the institutional ethics committee as a part of the SE 2020 study (1487-CE Lazio-1, July 20, 2016). The study was funded with institutional funding of the Italian National Research Council and with travel grants of the Italian Society of Echocardiography and Cardiovascular Imaging with dedicated sessions during national meetings. No fort from industry was asked for or received. An obligatory web-based educational platform was developed to facilitate the training process. Participating cardiologists were invited by email to join the platform, which was protected by user-specific passwords. The platform includes files and videos with detailed instructions on how to start the training and allows downloading and uploading of external files. The sequence of the certification process and web-based learning has already been detailed and follows the same template used for RWMA . We decided to have this platform mandatory and not optional as in the step-1 for RWMA, since in case of B-lines the technique is relatively young and recent advances in acquisition (with 4-site scan mode) and reporting were adopted in the SE2020 platform . Sixty readers from 52 different centers initially asked to enter the SE2020 study, had passed the RWMA test for quality control and therefore were allowed to enter the step-2 of SE2020. All participants were clinical cardiologists and expert echocardiographers with ongoing high volume (> 100 tests per year) SE activity and the years of experience in SE ranged from 5 to 31 years (mean value 18 years). All were certified by national and/or international societies . To acquire lung ultrasound (LUS) images adopted for quality control test, we used commercially available ultrasound machines (IE 33, Philips, Medical Systems, Andover, Massachusetts, USA with a 2.5–3.5 MHz phased-array sector scan probe; Vivid E9, GE Healthcare, USA, manufactured in Horten, Norway, equipped or standard M5S transducer with second harmonic technology; Mylab Eight platform Esaote, Genova, Italy). The depth was adjusted according to the body habitus of the patient, with thin patients requiring less depth and obese patients needing greater depth to visualize the pleural line. A B-line was defined with 4 constant criteria: vertical, laser-like, hyperechoic reverberation; arises from the pleural line extending to the bottom of the screen without fading; moves synchronously with lung sliding; and erases the A-lines, which are a part of the normal lung pattern as a horizontal, multiple reverberation artefact, equidistant from one another below the pleura, at exact multiples of the transducer-pleural line distance . Detailed description of the scanning procedure and scanning sites is also available in a 2-min movie from our laboratory on YouTube (The incredible ULCs – ultrasound lung comets. Available at http://www.youtube.com/watch?v=7y_hUFBHStM. Accessed: July 10, 2018). LUS scanning was performed with the cardiac probe in the supine position at rest and soon after stress (with the patient again resuming the supine position). The 4-site simplified scan of the lung was used . We analyzed the anterior and lateral hemithoraces, scanning along the anterior axillary (AA) and midaxillary (MA) lines on the third intercostal space (Fig. 2). 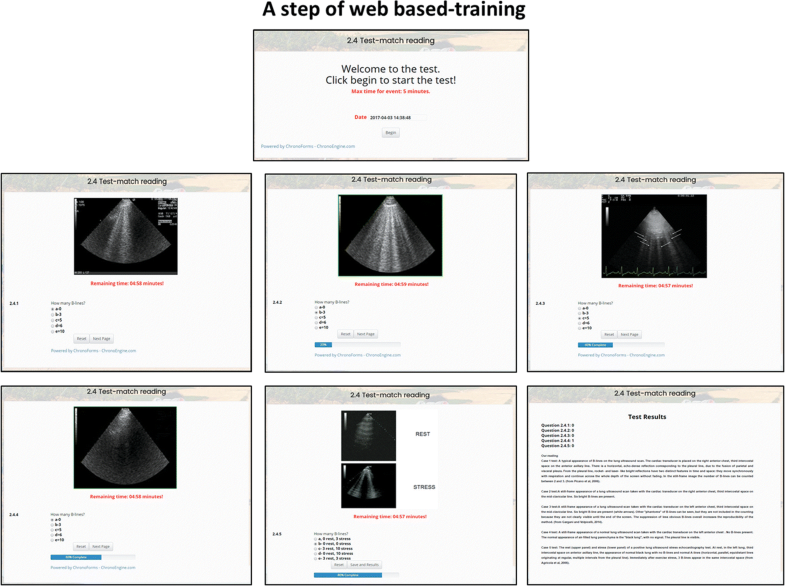 The 2-h web-based training module (http://se2020.altervista.org) consisted of five sequential learning blocks: a- Selected readings of 3 recent review or original articles summarizing the evidences supporting the use of B-lines during stress and the adopted scan technique and scoring criteria [8, 10, 13]; b- A power-point file of 25 slides summarizing key points and specific literature supporting the proposed reading policy illustrating tips and tricks highlighting the most frequent problems in B-lines interpretation with special focus on the technicalities of the 4-site simplified scanning technique; c- A theory self-assessment test with five questions with four answers each (only one correct) preliminary to video-clip reading; d- Short (< 15 s) video-clips of examinations with the same format of official test reading, with 5 min per reading with countdown clock, and one possible answer (from 0 to 10) for each video-clip (Fig. 3). An expert trainer (QC or MCS) remained available to all readers for e-mail or phone contact to provide assistance with any issue concerning the training. At all times there was the possibility of face-to-face discussion (via Skype) to address issues requiring special clarification with the principal investigator. After completing the web-based module the reader could take the test (maximum three attempts). After each attempt, the sequence of videos was mixed. We selected 20 cases of 10 patients (with rest and stress images) in which the presence and number of B-lines was documented by unanimous decision of 2 experienced observers (EP and QC). The privacy of patients during acquisition, storage, and transmission of the SE study was protected. All images were anonymized, and the identity of patients or the study condition (rest or stress) was not disclosed at any time to the readers. 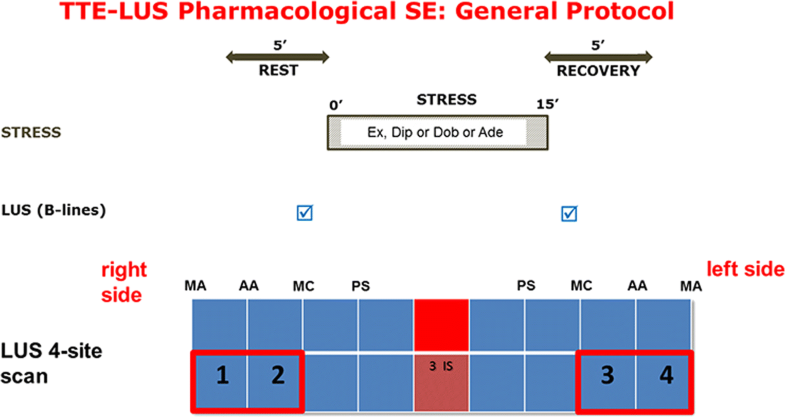 Each SE study was structured in a single video-clip of 10–15 s, with either resting or stress images. Each test clip was scored from 0 (black lung, A-lines, no B-lines) to 10 (white lung with coalescing B-lines). The diagnostic gold standard was the reading of Pisa lab. The answer of the reader was considered correct if concordant with reference standard reading ±1 (for instance, reference standard reading of 5 B-lines; correct answer 4, 5, or 6). The a priori determined pass threshold was 18/20 (≥ 90%) with R value of intra-class correlation coefficient > .90. The LUS images were selected to represent the garden variety of stress testing modes, responses, results and image quality. They came from six different laboratories (Benevento, Lucca, Pisa, Porto Alegre, Rome, St Petersburg) in three countries (Brasil, Italy, Russian Federation), and showed the full spectrum of responses (from 0, n = 7; to 10, n = 1). All images were considered readable, with quality ranging from average-to-good (n = 16) to excellent (n = 4) in the assessment of the reference standard reading. The stress employed was exercise in 17 subjects, high dose accelerated dipyridamole (0.84 mg/kg over 6 min) in 2 and dobutamine (40 mcg/kg/min) in 1. The projection selected was the third intercostal space between left mid-axillary and anterior axillary lines in 4; third intercostal space between right mid-axillary and anterior axillary lines in 4; third intercostal space between right anterior-axillary and mid-clavicular lines in 4; third intercostal space between left anterior-axillary and mid-clavicular lines in 8. The response was pass (≥ 90% accuracy) or fail. With pass, the reader received a certificate of accreditation and could start recruiting with a written informed consent signed by each patient and after clearance by the local ethical committee. With fail, the unsuccessful reader could retake the test after 1 month. After the second fail, the reader could undergo training in a recommended center and try again after 1 year. Each reader was evaluated against the gold standard of reference standard reading for assessment of individual accuracy (in %). The intra-class correlation coefficient was calculated, for each reader, in the whole series of 20 paired measurements made by the peripheral reader and the reference reader. Intra-observer agreement was tested in 20 peripheral readers who volunteered to repeat the measurement session after at least 3 months from the first reading. A p value < 0.05 was considered significant. Of the initial 60 readers who started, 53 were B-lines naive (without previous exposure to B-lines). All 60 readers were successfully accredited (Fig. 4): 26 (43%) on first, 24 (40%) on second, and 10 (17%) on third attempt. The 53 B-lines naive scored similarly to the 7 B-lines expert on first attempt (90 versus 95%, p = NS). Compared to the step-1 of quality control for regional wall motion abnormalities , the mean reading time per attempt was shorter (17 ± 3 vs 29 ± 12 min, p < .01), the first attempt success rate was higher (43 vs 28%, p < 0.01), and the drop-out of readers smaller (0 vs 28%, p < .01). The average diagnostic accuracy of the 60 accredited readers was 95%. Considering the final attempt of the 60 readers, the Spearman correlation coefficient between the expert reference reading and the reading of each peripheral reader was very high (R = 0.95, p < .0001). In the 20 peripheral readers who repeated the test a second time at least 3 months after accreditation, the Spearman correlation coefficient was also very high (R = 0.97, p < .0001). A user-friendly web-based learning is highly effective for training B-lines also for echocardiographers without previous exposure to B-lines. After a limited learning effort, the accuracy of B-lines reading is comparable between very experienced and freshly trained readers. B-lines with 4-site simplified scan of the lung has a very high success rate in acquisition and analysis. It has been embedded as an integral part of dual imaging SE adopted as the core protocol in SE2020 for all forms of physical and pharmacological stress for all patients, from coronary artery disease to heart failure. The American College of Chest Physicians has defined the knowledge and technical elements required for competence in lung ultrasound . There have been a number of prior lung ultrasound education papers, showing that a limited training of a few hours can improve the capability of execution and interpretation of LUS even in medical students without previous exposure to ultrasound [19, 20]. In the present study we are dealing with a specific and limited aspect of LUS of special interest for cardiologists, i.e. the detection of B-lines. There is a lack of a specific training and certification pathway in cardiology, and as a result training and performance of LUS varies widely among different institutions. An approach similar to the one adopted in the present study was developed in Pisa for centers recruiting in the LUST study . However, this study differs from the previous one under some aspects: first, it was focused on LUS-SE, not on resting LUS; the adopted scan scheme was the simplified 4-site scan, easier to do, to teach and to learn than the previously adopted 28-site scan; and the quality control procedures required some prior reading and slide presentation to facilitate a standardized learning . Our findings are consistent with a large body of literature showing that stable web applications are increasingly used for improving medical image interpretation skills regardless of time and space and without the need for expensive imaging equipment or a patient to scan . With the adopted web-based approach, the educational path is standardized, shared, and - after validation and refinement - prospectively available in open source, and exploitable for scientific purposes and clinical education. The use of enabling technologies makes the accreditation process faster, smoother and cheaper, and coupled with the open-source platform grants an unprecedented opportunity for continuing education, also fostered by endorsement and governance by the scientific society supporting the study. We focused on the assessment of B-lines, which is a particularly simple aspect of LUS diagnosis [10, 11]. Similar harmonization and accreditation issues are present for other aspects of SE diagnosis. Separate and parallel training modules are currently under construction within the framework of “SE 2020” to cover the entire spectrum of key aspects of SE diagnosis, from coronary flow velocity reserve to left ventricular volumes and pulmonary hemodynamics . A key aspect in the evaluation of SE results is the adoption of an undisputed diagnostic “gold standard”. The lack of a universally acceptable gold standard makes the assessment of reading performance difficult. From the library of images arriving from all the world and stored in our data bank, we selected cases meeting the conditions of unanimous reading of the two most experienced readers from the reference lab. This is a far from perfect gold standard, yet a reasonable, and perhaps the only possible, one. We restricted our validation phase to participants in the SE2020 study, who had a substantial reading experience and certification in RWMA as a prerequisite. This reader pool may have been especially knowledgeable and motivated, thereby justifying the excellent learning results. However, 53 of them were B-lines naive, and therefore probably the selection criteria of our readers did not affect the generalizability of results. We adopted a simplified 4-site scan for acquisition of B-lines at rest and during stress. This approach introduces a substantial abbreviation compared to other protocols such as the 28-region scan originally adopted in the Pisa laboratory in the first application of LUS in heart failure patients  and also recommended by an international consensus in 2012 . Over the years, simplified 8-zone and 4-zone lung imaging protocols were proposed [25, 26], with comparable information between the 2 protocols as shown by Platz et al. . Scali et al. showed that the simplified 4-site scan allows to complete the assessment of B-lines in 20 s (instead of the 3 min required by the 28- region scan). There is a linear, close correlation between the 28-site and the 4-site B-lines score . Therefore, there is no significant loss of information when going from 28- to 4-site scan, but a substantial simplification and time saving, vital for SE imaging, when there are so many things to see and so little time available. B-lines are a useful adjunct to mainstream SE based on RWMA [27, 28], but its impact may be limited by the relatively few centers currently using it in their routine SE practice, and the lack of standardization in acquisition, scoring and reporting . After a web-based module and certification, the approach is better harmonized and the accumulation of clinical practice also allows the rapid growth of scientifically unique data. To achieve this goal, simplification is essential, and the 4-site simplified scan is ideal for LUS rest and stress testing. However, the SE technique does not tolerate improvisation, and an accurate standardization of terminology, standards of execution, and interpretation criteria is required before a center is allowed to enter its experience in the common data bank. Similarly to what has been said for meta-analysis , multicenter SE studies are like a bouillabaisse: no matter how much seafood (or recruiting centers) is added, one tainted fish (an unreliable center generating inconsistent reading) will spoil the pot. Web-based learning is highly effective for teaching and harmonizing B-lines reading, with an enormous saving of time and resources versus the conventional hands-on approach of teaching and learning ultrasound techniques. Echocardiographers without previous experience with B-lines learn quickly. The study was partially funded with the project Aging of the National Research Council. On behalf of the Stress Echo 2020 Study Group of the Italian Society of Cardiovascular Echography (as per December 20, 2017). Eugenio Picano1, Maria Grazia Andreassi1, Clara Carpeggiani1, Michele De Nes1, Marco Paterni1, Lorenza Pratali1,Quirino Ciampi2, Bruno Villari2, Eduardo Bossone3, Rodolfo Citro3, Francesco Ferrara3, Paolo Colonna4, Marco Fabio Costantino5, Lauro Cortigiani6, Antonello D’Andrea7-1, Claudio Dodi8, Nicola Gaibazzi9, Maurizio Galderisi10, Andrea Barbieri11, Ines Monte12, Fabio Mori13, Iacopo Olivotto13, Barbara Reisenhofer 14, Federica Re15, Fausto Rigo16, Maria Chiara Scali17,41, Sergio Severino7-2, Paolo Trambaiolo19, Miguel Amor20, Jorge Lowenstein21, Pablo Martin Merlo21, Clarissa Borguezan Daros22, José Luis de Castro e Silva Pretto23, Marcelo H. Miglioranza24, Marco A.R. Torres25, Daniel Quesada Chaves26, Melissa Rodriguez Israel26, Iana Simova27, Albert Varga 28, Gergely Agoston 28, Attila Palinkas 28, Jelena Čelutkienė29, Jaroslaw D. Kasprzak30, Karina Wierzbowska-Drabik30, Ana Djordjevic-Dikic31, Branko Beleslin 31, Milica Dekleva32, Aleksandar N. Neskovic33, Ivan Stankovic33, Angela Zagatina34, Giovanni di Salvo35, Julio E. Perez 36, Ana Camarozano 37, Anca Corciu38, Alla Boshcenko39, Fabio Lattanzi40, Carlos Cotrim41, Paula Fazendas42, Maciej Haberka43, Bozena Sobkowicz44, Wojciech Kosmala 45, Tomasz Witkowski45, Piotr Gosciniak 46, Alessandro Salustri 47, Hugo Rodriguez Zanella48, Alexandra Nikolic49, Suzana Gligorova 50, Madalina-Loredana Urluescu 51, Maria Fiorino 52, Giuseppina Novo53, Tamara Preradovic-Kovacevic54, Miodrag Ostojic33, 54, Dario Gregori55. 1Institute of Clinical Physiology, National Research Council, Pisa; 2Cardiology Division, Fatebenefratelli Hospital, Benevento, Italy; 3Cardiology Department and Echocardiography Lab, University Hospital “San Giovanni di Dio e Ruggi d’Aragona”, Salerno, Italy; 4Cardiology Hospital, Policlinico of Bari, Italy; 5Cardiology Department, San Carlo Hospital, Potenza, Italy; 6Cardiology Department, San Luca Hospital, Lucca, Italy; 7Cardiology Department, Monaldi Hospital, Second University of Naples, Italy; 8Casa di Cura Figlie di San Camillo, Cremona; 9Cardiology Department, Parma University Hospital, Italy; 10Department of Advanced Biomedical Sciences, Federico II University Hospital, Naples, Italy; 11Cardiology Department, Modena University Hospital, Modena, Italy; 12Cardio-Thorax-Vascular Department, Echocardiography lab, “Policlinico Vittorio Emanuele”, Catania University, Italy; 13Cardiology Department, Careggi Hospital, Florence, Italy; 14Cardiology Division, Pontedera-Volterra Hospital, ASL Toscana 3 Nord-Ovest, Italy; 15Cardiology Department, San Camillo-Forlanini Hospital, Roma, Italy; 16Cardiology Department, Ospedale dell’Angelo Mestre-Venice, Italy; 17Cardiology Department, Nottola Hospital, Siena, and Cardiothoracic Department, University of Pisa, Italy; 18Cardiology Department, Ospedale Santa Maria Incoronata dell’ Olmo, Cava de’ Tirreni, Salerno, Italy; 19Department of Cardiology, Sandro Pertini Hospital, Rome, Italy; 20Cardiology Department, Ramos Mejia Hospital, Buenos Aires, Argentina; 21Cardiodiagnosticos, Investigaciones Medicas, Buenos Aires, Argentina; 22Cardiology Division, Hospital San José, Criciuma, Brasil; 23Hospital Sao Vicente de Paulo e Hospital de Cidade, Passo Fundo, Brasil; 24Cardiology Institute of Rio Grande do Sul, Porto Alegre, Brasil; 25Hospital de Clinicas de Porto Alegre - Universidade Federal do Rio Grande do Sul, Porto Alegre, Brasil; 26Hospital San Vicente de Paul, Heredia, Costa Rica; 27Acibadem City Clinic Cardiovascular Center, University Hospital, Sofia, Bulgaria; 28Institute of Family Medicine, University of Szeged, and Department of Internal Medicine, Elisabeth Hospital, Hodmezovasarhely, Hungary; 29Centre of Cardiology and Angiology, Vilnius University Hospital Santaros Klinikos, Faculty of Medicine, Vilnius University, State Research Institute for Innovative Medicine, Vilnius, Lithuania; 30Chair of Cardiology, Bieganski Hospital, Medical University, Lodz Poland; 31Cardiology Clinic, Clinical Center of Serbia, Medical School, University of Belgrade, Serbia; 32Clinical Hospital Zvezdara Belgrade, Serbia; 33Department of Cardiology, Clinical Hospital Center Zemun, Faculty of Medicine, University of Belgrade, Serbia; 34Cardiology Department, University Clinic, Saint Petersburg, Russian Federation; 35Pediatric Cardiology Department, Brompton Hospital, London, UK, Division of Cardiology; 36Washington University School of Medicine, Barnes-Jewish Hospital, St. Louis, Missouri, USA; 37Hospital de Clinicas UFPR, Medicine Department, Federal University of Paranà, Curitiba, Brasil; 38Department of Cardiology, IRCCS Policlinico San Donato Clinic, Milan, Italy; 39Cardiology Research Institute, Tomsk National Tomsk National Research Medical Center of Russian Academy of Sciences; 40Cardiothoracic Department, University of Pisa, Italy; 41Heart Center, Hospital da Cruz Vermelha, Lisbon, and Medical School of University of Algarve, Faro, Portugal; 42Cardiology Department, Hospital Garcia de Orta, Almada, Portugal; 43Department of Cardiology, School of Health Sciences, Medical University of Silesia, Katowice, Poland; 44Department of Cardiology, Medical University of Białystok, Poland; 45Department of Cardiology, Wroclaw Medical University, Wroclaw, Poland; 46Department of Cardiology, Provincial Hospital, Szczecin, Poland; 47Hamad Medical Corporation, Heart Hospital, Doha, Qatar; 48Instituto Nacional de Cardiologia Ignacio Chavez, Mexico City, Mexico; 49Institute for Cardiovascular Diseases Dedinje, Belgrade, Serbia; 50Cardiology Division Ospedale Casilino, Roma Italy; 51Cardiology Department, County Hospital Sibiu, Invasive and Non-Invasive Center for Cardiac and Vascular Pathology in Adults - CVASIC Sibiu, Faculty of Medicine Sibiu, Romania; 52Cardiology Division Ospedale Civico Di Cristina Benfratelli Palermo; 53Cardiology Division, University Hospital, Palermo, Italy; 54University Clinical Center, Banja Luka, Republic of Srpska, Bosnia and Herzegovina; 55Department of Biostatistics, University of Padua, Padua, Italy. Institutional funding from CNR Institute of Clinical Physiology. Data sharing not applicable to this article as no data-sets were generated or analyzed during the current study. See the stress echo 2020 website at: http://se2020.altervista.org/index.php/en/. (user name: reviewer; temporary password: N4ppGVgu70). See the quality control content and modalities at: https://stressecho2020.moodlecloud.com/login/index.php. (user name: reviewer; temporary password: N4ppGVgu70). EP is the study chairman, designed the protocol, organized the content of web-based training and drafted the manuscript; QC is the principal investigator of SE2020, helped to organize the structure of training, contributed to developing the web-based training, critically revised the manuscript for an intellectually important contribution and approved the submitted version; McS is the project leader of B-lines subproject in SE2020; MdN is the computer scientist who developed the website (SE 2020) and the web-based training material; MP is the computer scientist who organized and governed the quality control access, results, and data analysis; all other authors contributed to study design, undertook the quality control up to certification, are active members of SE 2020 consortium and critically revised the manuscript for an intellectually important contribution and approved the submitted version. RC and PC also coordinated the involvement of SIECVI (Società Italiana di Ecocardiografia e Cardiovascular Imaging). CC is responsible for data quality control and reader’s certification. The study protocol was reviewed and approved by the institutional ethics committee as a part of the SE 2020 study (1487-CE Lazio-1, July 20, 2016). All the authors have read and approved the manuscript and accorded the consent for pubblication. Picano E, Scali MC. Stress echo, carotid arteries and more: its versatility for our imaging times. Editorial comment JACC img. 2017; https://doi.org/10.1016/j.jcmg.2017.01.023.